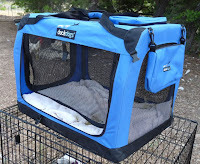 I'd been looking for a portable crate that'd work for both the geese and chickens. Do you know what a pain in the tookus that's been? I finally saw a likely candidate at our favorite warehouse store, Costco. 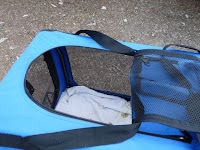 Spendier than the standard plastic pup crate, but after a recent vet visit, I am happy to report that it was well worth the money. 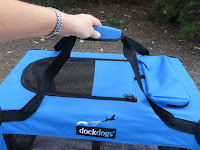 The DockDogs pet carrier has three different ways to put in a chicken or a goose - long-side, short-side, or from the top. 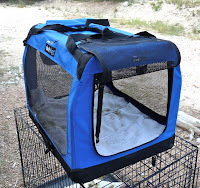 (I've got the "large" version, 27"x20"x20") The top can be unzipped partially in such a way that a goose has enough room to stick her head out to stand and stretch, or look around. Pockets on top and back for food, paperwork, whatever you need. Washable by hose, because heaven knows geese can crap like champions. A cushioned floor pad (also washable) to absorb shocks on the dirt road out of our property. Lightweight but sturdy, using metal pipes for the frame. Easy to carry. What else can I say? Two thumbs up; highly recommended. A vet visit for Miss Cecily the Goose - who was having problems keeping her wings on her back - showed that she was very thin (yikes! talk about feeling like a bad goose mom!). She might have looked like the fattest goose of the bunch, but as the vet showed me, it's almost all feathers. The other geese aren't nearly as skinny, but the vet declared they were on the thin side as well. I'm guessing nobody wants to leave the shady, cool spot to go eat at the main feeder. With the bright sun and searing heat, who could blame them? The vet, bless him & his kin, arranged additional greens & veggies for the geese (besides what we already feed them in the mornings). One of his clients owns a restaurant, and she agreed to let me have the leftovers from meal prep. All I have to do is pick them up. Thank you so much, Linda! We've also set up a new feeder in the shaded area. So far, the new feeder is working out well: so well, I may set up a second feeder in the shady area. The full feeder from yesterday morning was down to crumbs by the early evening. In addition, electrolytes with vitamins are being added to their water, and I picked up a bag of 30% protein game-bird feed to add to the organic feed. Gotta get the girls fattened up once more! As the Sicilian side of my family would say, "Eat! Eat!! You're so skinny, you're making me look poor!" I guess the plumber accidentally let them out the gate yesterday morning. There's no other explanation. 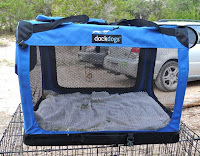 Spouse & I walked and drove around in the gawdawful Texas heat and dust, calling for the dogs. No response. Bandit's vet appointment that afternoon had to be canceled. Nothing left to do but leave the gates open in case the little ingrates made their way back home, and ready the printer for a dozen "Missing Dog" posters. They finally came back in the late afternoon, looking worn out from head to toe. You gotta click on the pics to see their miserable expressions, sprawled out under the shade oaks and water misting hoses. Yep, I'm enjoying some good old-fashioned schadenfreude right now. Rotten dogs! 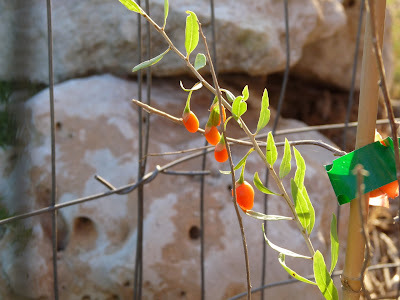 Of all the goji plants, I never expected this particular one to fruit; especially in the first year. It resides in a particularly hot & sunny area, and was looking pretty sad the first six weeks or so after transplant. Lo & behold the fruit! I'm now watching closely to see at what point the berries are "ripe" versus "overripe", so I know when to pick. 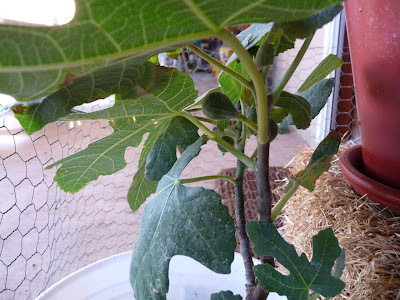 Another plant that I didn't expect to fruit: the lone fig still in the rooting bucket. We planted two figs in the garden last year, and although they're growing like gangbusters, there's still no fruit. But the little bucketed one has three figs popping out. Go figure. It's been unseasonably warm for June, but now we're sliding towards July where these sort of temperatures are more the norm. Seasonable or not, the warmer weather means making sure the animals are kept cool and hydrated. 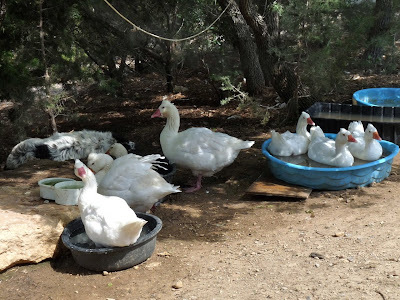 In the past, we put up shade tents in the goose & chicken pen. The shady grove on the other side of the house, however, is doing a much better job of cooling down the animals, and much less expensively. Every shade tent we put up last year got torn to shreds by the high winds. The oaks and cedars have no such problems with the breezes. The animals all gather, and share the cool space with very little squabbling. They only leave the area if they get hungry, and once fed, head straight back to the grove. The geese stand in the pools, letting the water cool them down via the bare skin of their legs. 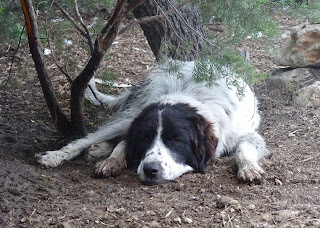 The chickens keep a respectable distance from the geese, but will often lay close to wherever the dogs are. 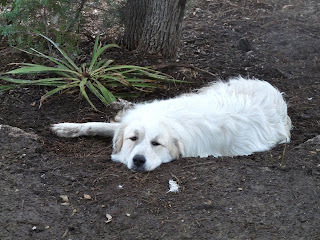 The dogs - heavily furred - have a knack for finding the coolest patches of soil. The Southwest wind blows hot, but the shaded area is a moderating force, along with the misting hoses. Everyone sleeps during the hottest part of the day, including myself. Summer here could be considered, energy-wise, more like Winter up North. Everything slows down. Grass and gardens start going dormant due to the weather. Any outdoor work, voluntarily done, is rushed through. Now that the Northern Solstice has passed, however, the days will begin getting short once more, with a return to cooler weather and increased activity not too far away. Until then, we're all laying low. From NOAA: Today: Mostly sunny and hot, with a high near 97. Heat index values as high as 105 [emphasis mine]. South wind around 15 mph, with gusts as high as 25 mph. I try going without the air-conditioner for as long as I can during Summer. Spouse is more uncomfortable with high temperatures, so had the A/C on over the weekend. I could not muster the will to turn it off after he left on Monday. I try to justify the A/C usage by keeping the thermometer at 81°F, but still feel like I've wimped out. @virgotex - who lives just down the road (hey, we gotta do coffee sometime) - is still managing to do without. She has my slack-jawed admiration. We're taking care of the animals as best we can. 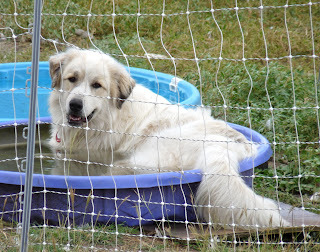 There's kiddie pools and tubs full of water in the pen and under the shady oaks on the other side of the house. Also under the shady oaks are two misting hoses to bring the temps down a bit more. Dogs, chickens and geese unite in their desire to stay cool, and all hang out together under the shade. Okay, Mom Nature, we get it - it's Summertime, and it's HOT! Nine randy boys were caught by fresh corn-on-the-cob and a very big fish net, and introduced to their new digs on Saturday. 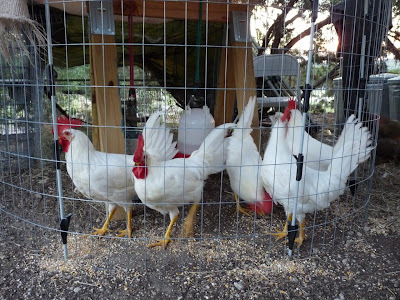 We combined the original long chicken run that the pullets used with the addition of a round, wired "corral". The run floor is covered with hay and several perches for evening snoozing, and the corral has plenty of dirt to scratch. The Taj Mah'Chicken* it ain't, but it's spacious and sturdy. The run and corral are both under the shady cedar tree grove plus covered over the top in shade cloth, but the roos can still get afternoon sun if they wish at the far end of the run. 'Course, with heat being in the upper 90°'s F, there's not too much interest in hanging out in the sunshine at the moment. The wiliest (and rudest, and randiest) of the bunch - heck, let's call him "Barry" - has tried six ways from Sunday to escape. He even somehow managed to climb the corral wiring, and attempted to squeeze out from between the top of the fencing and the shade cloth. Wish I'd had my camera, it was an impressive effort! 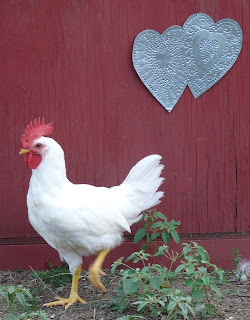 Poor boy; when any of the girls come by, he races around the corral and clucks mournfully. 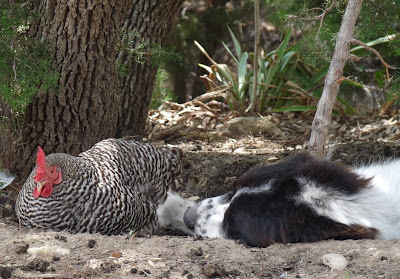 Two roosters were picked out for the Hen Protection Squad - the lone Barred Plymouth Rock roo, and one of the lucky (very lucky) Leghorns. I said a little prayer to the Universe asking for help picking out the best Leghorn roo for the girls. As soon as I finished, one of the roos walked up next to me and looked me square in the eye. He got picked. He better live up to expectations, tho' - there's plenty of roos who'd be more than happy to take his spot. As for the corralled bachelors, it makes me a little sad to have them sequestered away from the girls, but the hens were getting so stressed by the constant attention that egg production went way down. Only a day and a half since the sequestering, and the girls are now back to their normal production. *Phrase taken from the name of Auntie's Jan & Karen's palatial chicken coop. Think my girls are spoiled? Hah! Although I don't think Billy-Bob (the gander) likes Bandit (the dog) all that much. The roosters have discovered "girls". Girls are neat! Hey, you're a girl, let me jump on you! The rooster's libidos have turned on with the power of a freight train, and they're just as subtle with their intentions. If it were only one or two young roosters, the girls would have no problems keeping them in line. Eleven* Ten roosters, however, are turning out to be a problem. Even the snarliest of the girls - Nutmeg - is hard pressed to keep the roosters intentions in check. I had planned on building the new chicken coop this week. 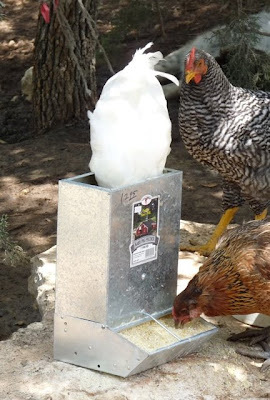 Instead, I'm bringing back the large covered chicken run, and will install an extra corral at one end. Come nightfall, nine* eight unlucky roosters will be plucked from their sleep spots in the cedar, and plunked into a wired monastery. Poor boys. The geese are now done with the egg-laying season, and back to their sweet selves. This video will serve to remind me, however, that this will be a yearly event, and to be prepared with thick jeans, gloves, and other self-protection come around next February through May. Mama loves her goozuls, yes she does!